The adventure begins again! After a four-year hiatus from long travels, we have hit the road once again. 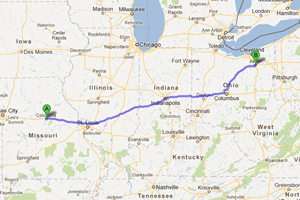 The goal: to help Patty and Chris move from Columbia, Missouri, to Northern Akron, Ohio. To be more specific, we are helping with Part 1 of the move, which involves moving Patty, their two dogs, and two of the four cats to Northern Akron. By getting the dogs out of their house in Columbia, Chris can finish prepping the house for sale. We volunteered to assist with the move. The plan is that we drive out to Columbia, help Patty and Chris load up a U-Haul trailer to the max limit, and then Sue will drive our car back loaded with Patty and the animals, and David will drive Patty’s jeep towing the trailer to Northern Akron. Two days to get to Columbia. Two days in Columbia. Two days driving to Akron! We will update as we can from the road!